My Wedding Music - Free iPhone, iPad App & My Wedding Music Podcast! _Strings Attached spent the last month developing an iPhone and iPad wedding music application application for our clients. It basically introduces you to our wedding music catalog. You can listen to audio clips, download ringtones, buy our wedding music on iTunes, and watch video. 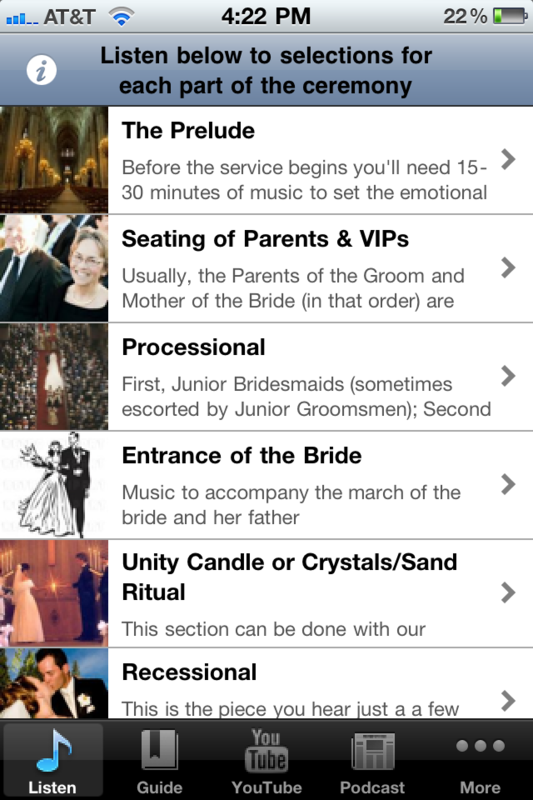 My Wedding Music app even helps you pick out the music for your wedding ceremony. We also offer a download of our Wedding Music Planner , and you can even print it! You have to check it out! We gave away our "My Wedding Music" iPhone and iPad application over the weekend and we have over 1000 downloads so far...and counting! When you search wedding music on your iPhone or iPad we come up right away! This is a huge step for Strings Attached. We're honored to share our app with you free of charge. We also have a PODCAST on iTunes called, Music For A Wedding Podcast. 1400 subscribers so far! Come on and join the club. It's free! New podcasts every week! Great for event planners, wedding coordinators, and "soon to be" wedding clients! Listen in to Will Taylor and special guests! "I'm mucho excited about the app I've created right here in Austin called: My Wedding Music Its an iPhone and iPad app that will help your clients choose and organize the music for their weddings in the palm of their hand. "It's available to our blog readers!..and everyone in the world! Thanks for sharing the information. That’s a awesome post. I will come back to read some more. Call, Text or email for a quote today!